On a planet dotted by large blue lakes and sweeping mountain ranges, the sky burns as drop pods containing Federation troops make planetfall, engaging the fungal armies of the Arborec. Meanwhile, light years away, plumes of smoke fill the air as the colossal manufacturing facilities of the cybernetic L1Z1K Mindnet toil endlessly to construct mighty warships to defend their borders against the hellish nightmares of the Nekro Virus. On another world, the brilliant minds at the Jol-Nor academies design schematics for new economic facilities while trade ships from the fanatical Yin Brotherhood and the entrepreneurial Hacan Emirates deliver goods from their far off colonies. And in distant corners of the galaxy, the ponderous Xxcha debate interstellar policy with the quiet Winnu in grand auditoriums, while the fierce insectoid warriors of the Sardokk N'orr cover their carapaces with tattooed symbols of war in preparation for the cosmic battles to come. If this sounds like the summary of a sci-fi opera novel, well, you're only partially right; this is actually the kind of stuff that goes on in Twilight Imperium, a grand strategy game of intergalactic proportions where players take on the roles of emperors, presidents, and dictators of star-faring races in the hopes of claiming the throne on Mecatol Rex - the ancient throne world that lies in the center of the crumbling empire - and ruling the galaxy. Twilight Imperium was first released in 1998 by tabletop powerhouse Fantasy Flight and is currently in its third incarnation. If this is your first time hearing of it, think of it like if video games Masters of Orion or Galactic Civilizations were a board game. 3 - 6 players (or up to 8 with the two expansions) compete for resources, technology and political power, making and breaking alliances every round. We here at the Escapist love big games of all stripes, and Twilight Imperium is one of our analog favorites. We've just started up another match here in the office, with several editors participating, when we decided "Hey! Why not write about our experiences playing this game?" Since Twilight can almost feel like an episode of Game of Thrones - rife with political duplicity and sudden but inevitable betrayals, we figured we'd give it a shot. 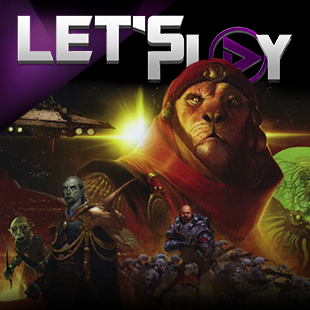 We'll give a weekly recap detailing the betrayals, trade deals and starship diplomacy that occur during our time playing the game. As you can probably tell by the above photograph, Twilight Imperium is a complex game with a bunch of moving parts. Realistically, it's not that difficult to play - it's the interactions between players and how you use the rules to your advantage that make all the difference. After building the galaxy through randomly distributed hexes containing planets, asteroids and other cosmic phenomenon, players compete to be the first to earn 10 victory points. This is achieved through completing both secret objectives dealt at the beginning of the game and those revealed from a randomized public objective deck. Objectives range from the simple, like having a technology from each of the four colored branches, to the difficult, like taking over an enemy's home world. Gameplay is split into three phases, Strategy, Action and Status. The Strategy phase is where all the players in order pick from one of eight strategy cards that both determine the turn order of the round in addition to providing a very specific ability to the player for that turn (and a second, optional ability for other players). Then comes the Action phase, where players can use tokens called Command Counters to build ships and troops, move fleets around the galaxy to invade or colonize unclaimed planets, or activate their strategy card to use its special abilities. The Status phase is a simple wrap-up of the round, everyone resets the board, gets some of their Command Counters back, earn victory points by meeting objectives, and hand back their strategy cards for the start of the next Round. 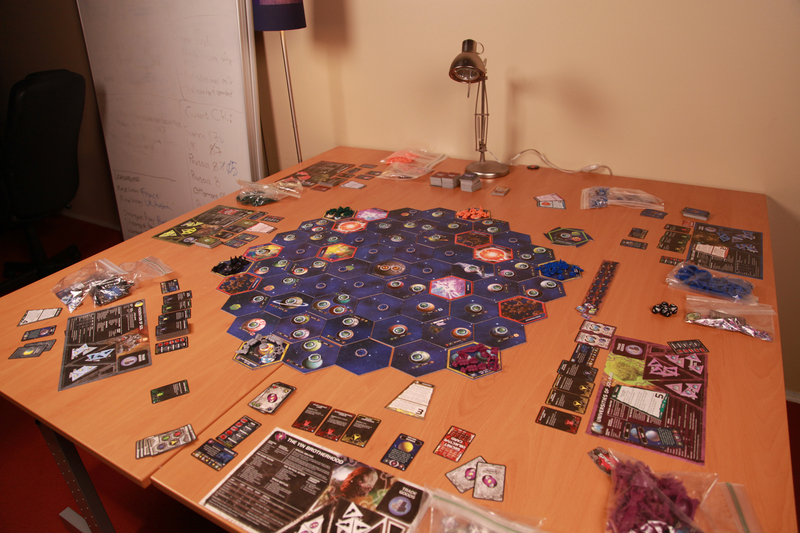 But the real fun of Twilight Imperium is how players interact each other. You'll be debating, threatening, begging and bargaining over all manner of topics in a single game. Whether it's reassuring a neighbor that the fleet you're moving around is harmless, or trying to convince other players to vote for you in the galactic senate during one of the game's many political referendums, how you speak and the actions you take against or with other players can have an effect on who walks away the winner. Because no matter who you ally with, only one player can claim the title of Emperor. The rulebook and two expansions for Twilight offer a multitude of extra tweaks and additions you can include to your game, several of which can drastically change the scale and the very nature of how its played. I won't bore you with the details of every optional ruleset we've decided to use (though if you really want to know, we've got them in the forum comments), but we decided to go with as big and robust of a game as we can. There's racial technologies, random events when colonizing worlds or exploring empty space, and special flagships... to sum up, there's a lot going on, and it's going to make for a very interesting saga. With both expansions, there are a total of 17 distinct alien factions to play in Twilight Imperium, each with their own special abilities that provide unique advantages (or severe disadvantages) in many aspects of the game. The Hacan, for example, are a race of lion-like humanoids who are masters of commerce and trade, while the Mentak Coalition are a collection of outlaws and outcasts who get to steal resources from other players. 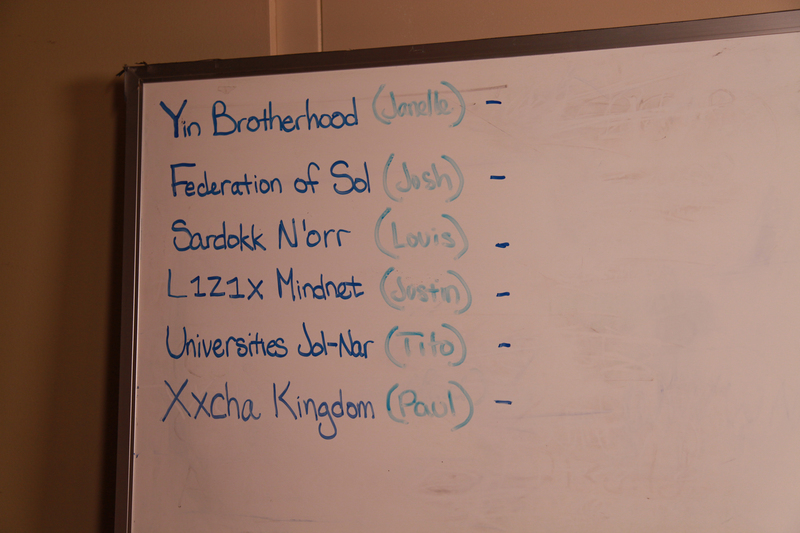 The Universities of Jol-Nar - Led by Chancellor Greg Tito. The Jol-Nar are a race of aquatic sapients in environment suits that also happen to have the most highly developed brains in the known universe. As such, they can usually research technologies faster than other races, but this comes at a cost - they're not very good in a fight. The L1Z1K Mindnet - Led by Integrated Turing Host Protocol Subserver Galactic Mindnet Advancement Algorithm Codename "Justin Clouse"
The L1Z1K claim to be the cybernetic descendants of a once powerful ancient empire, and with access to advanced technologies and manufactories can more easily build Dreadnoughts, one of the most powerful starships available in the game. The Xxcha Kingdom - Led by Paul Goodman the Greater, Supreme Monarch of the Xxcha Kingdom, Protector of its Subsidiary Worlds, Emperor of the Seven Hosts, Lord of Pau-Pau, Master of Destiny, and Ambassador to the Galactic Races. The Xxcha are giant walking turtles. Due to their long lifespans, years of constant debate, and philosophical discussions, they are excellent diplomats. The Federation (Namely, humans) may not have psychic powers or start with advanced weaponry, but since most of the human population is aggressive and suited to war, they are able to create large armies of ground forces with ease. The Brotherhood are a theocratic collective race composed entirely of genetically modified clones, who through their fanatical devotion to their religion can, in many cases, convert enemy forces to their side. The Sardakk N'orr - Led by Hive Alpha Louis Weber. A race of deadly and aggressive warrior bugs, the Sardakk N'orr have the most straightforward ability of all, gaining a +1 to their combat rolls. All of them. All the time. Forever.